MICHAEL KEEGAN-DOLAN'S 'SWAN LAKE/LOCH NA HEALA'. PHOTO BY PRUDENCE UPTON. Strange and unsettling, bleak and raw, Michael Keegan-Dolan’s Swan Lake/Loch na hEala is not your standard traditional classical ballet version of Swan Lake. There is no Tchaikovsky music, no royal palace, no huge corps de ballet of fluttering swans in white tutus. Michael Keegan-Dolan’s ‘Swan Lake/Loch na hEala’. Photo by Prudence Upton. Written, directed and choreographed by Keegan-Dolan for his company Teaċ Daṁsa (which has emerged in the wake of his former company Fabulous Beast Dance Theatre), Swan Lake/Loch na hEala is instead set in the grim Irish midlands of County Longford. While it is extremely different than the much-loved 19th century Russian ballet, the work does contain several key plot similarities. The work also incorporates an Irish myth called The Children of Lir, about a woman who marries a king whose wife has died. Jealous of his relationship with his four children, she plans to kill them but has a change of heart and instead transforms them into swans for 900 years. The swans are discovered by a saint, who manages to return them to their human form; they then die and eventually ascend to Heaven. The set strips the stage back to the theatre’s bare brick walls with looming scaffolding, four step ladders of assorted size, each with a large pair of feathered wings, and there are various props tables and chairs moved in and out as required. Visually, there are some stunning images, such as the swan wings and the use of plastic for the lake. In this stark version by Keegan-Dolan, Prince Siegfried becomes commoner Jimmy (Alexander Leonhartsberger), a depressed young man in daggy track pants and beanie who hasn’t recovered from the loss of his father a year ago. Making things worse and adding to Jimmy’s annoyance, his wheelchair-bound mother Nancy (Australian dancer Elizabeth Cameron Dalman) has sold the family home to move into a new public housing apartment. Cameron Dalman gives a taut, hypnotic performance as the imperious family matriarch, at times regal, at times witch-like. In an attempt to cheer him up, Nancy organises a party for Jimmy’s birthday, having given him his father’s shotgun as a present. The party is horrendous, and Jimmy heads to the lake where he encounters Finola, the equivalent of Odette (Rachel Poirier), and her three sisters who were turned into swans by an abusive priest (the man we first saw on stage upon entering the theatre, in effect the von Rothbart figure). Keegan-Dolan combines dance, music and words to tell the story with Irish actor Mikel Murfi giving his all in an extremely searing and revealing powerhouse performance, sort of acting as narrator while portraying several characters – a manipulative politician, the priest, a cool DJ in sunglasses and a police sergeant, among others. When we first see him, as the audience enters, he is a holy fool, dressed only in white underpants, tethered to a concrete block by a long rope and making animal noises. He walks like a bird at times, with avian movements of the feet and arms. We eventually learn that he is a man who has lost his humanity, a priest transformed into a strange creature by his abusive behaviour and a curse he has put on others. The score, stark, haunting and with a Gaelic lilt, blends Irish and Nordic folk tunes and includes a Swedish song and a Finnish lullaby. It is played by a Dublin-based trio called Slow Moving Clouds, consisting of a fiddler (Danny Diamond), a cellist (Mary Barnecutt), and a Finnish musician called Aki, who plays the nyckelharpa, which looks sort of like a zither. The choreography often has allusions to fleet footed folk dance with curved open arms, fabulous creamy épaulement and lots of whirling, light, circular movement, with soft yet powerful low jumps, as well as some rolling floorwork. Two pas de deux in particular stand out both for Jimmy and Finola. The first has them tentative and almost afraid to touch, until they are at last able to make hesitant contact. The later second one is breathtaking, as Leonhartsberger lifts Poirier lyrically and tenderly, almost in slow motion in a delicate dance of love. Leonhartsberger, earlier as the depressed Jimmy, has a series of extraordinary sculptural balances on a set of concrete bricks. Leonhartsberger persuasively develops a crushed character caught up in unexpected events leading to the tragic end. The other three sister swans have their male equivalent in the Watchers, who sort of act as a chorus and can be quite menacing. 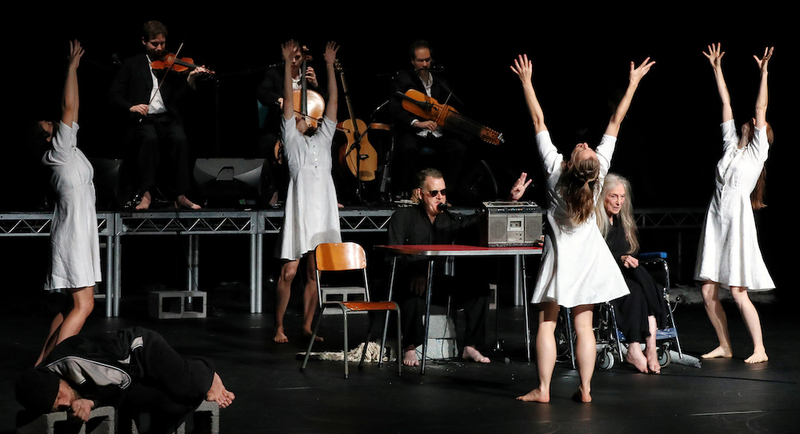 Swan Lake/Loch na hEala is dynamic, yet stark and challenging, a most thought-provoking and unusual production that is riveting yet confronting.